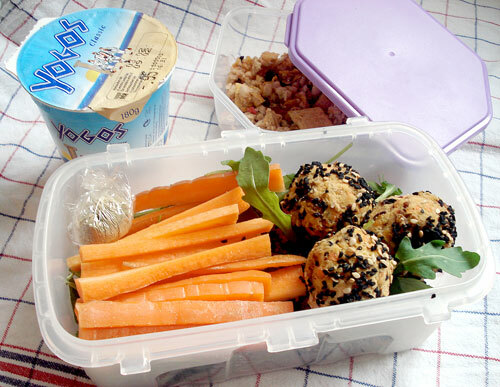 If you have to pack breakfast and lunch, or even lunch and a snack, this sort of 2-in-1 bento is one idea. This is my bento, or bentos, from Tuesday, when I had a very early morning start. The main container has the lentil snacks (pre-made), carrot sticks and greenery (mostly arugula/rucola, some mâche (lamb’s lettuce). (Note the little twist of seasoning in the plastic wrap - it’s chutney podina masala described here .) I brought the Greek yogurt along in its container. 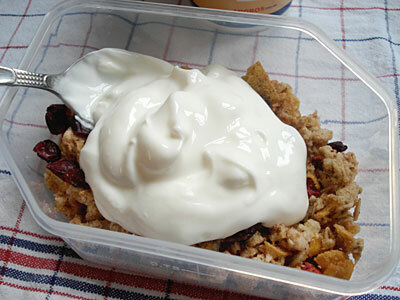 In the small plastic side-container is about 1/2 cup of muesli (Swiss breakfast cereal). 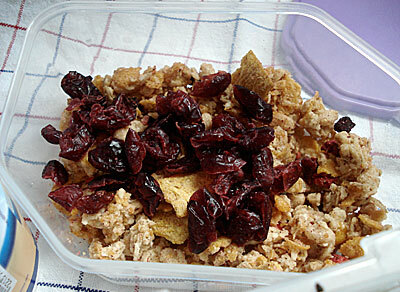 I added a few dried cranberries for extra sweetness. 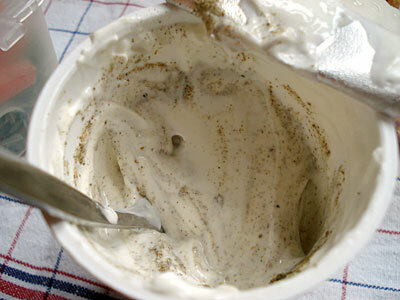 Muesli is often eaten here in Switzerland with yogurt. I added about 1/2 of the Greek yogurt container, mixed it up, and - voilà, a quick and easy breakfast. You could make this a vegan bento by just substituting soy yogurt for the Greek yogurt, since everything else is vegan anyway.